The UI Associate Board hosted Work to Play program participants from Lawndale, Ward, and Walsh for the 5th Annual #UIAB Pizza Party. 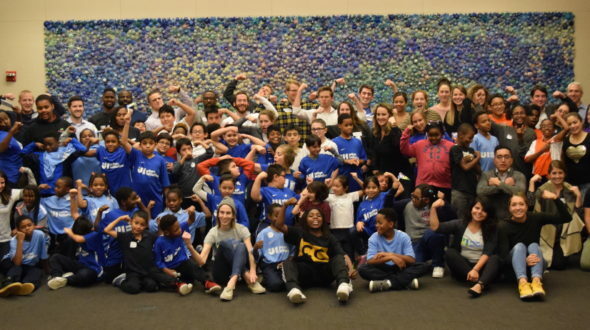 Urban Initiatives would like to thank Neil Hirshman, Suzie Bohacik, and Kirkland & Ellis for hosting our Associate Board members, UI students, staff, and coaches for another year of fun! Read below as AB member Ashley Jordan recaps this one-of-a-kind event that brings together students and young professionals for some pizza, fun, and exploration. The Fifth Annual Urban Initiatives (UI) Associate Board (AB) Pizza Party took place last Thursday, November 16th at law firm Kirkland & Ellis. Students from Walsh, Ward, and Lawndale Elementary attended this year’s party, which saw a turnout of over 60 students, parents, UI staff, and Associate Board members. The UIAB Pizza Party serves as an opportunity for students in UI’s Work-to-Play and Take the Lead Programs and our Associate Board members to learn more about each other, meet new faces, and participate in fun, creative team building activities – and eat pizza! Before arriving, students got the chance to travel downtown on street trolleys, where they sang songs and got pumped up for the night before being greeted at Kirkland & Ellis by our AB volunteers. The night started with a fun game of Bridgeball before our students were split up into 12 teams with students from each school and 2-3 AB members. Our students and AB members interviewed each other about favorite sports teams, current careers, and future aspirations. One thing we all gained from this exercise was learning that no matter how old you are, or where you grew up, everyone has goals, dreams, and passions. After pizza, the games began with a competition to see which team could build the coolest shape out of dominoes – and all the tiles had to fall! Despite some awesome creations, Team 112 took first place and won some awesome UI swag. The party continued with a Human Chain Hula Hoop competition and Balloon Tag Team Relay Race that ended with a lot of laughter from both our students and AB members. The 2017 UIAB Pizza Party was a huge success, and we thank all of our volunteers who took time to make the night as fun and memorable for our students as possible. Also, a big thank you to Kirkland & Ellis for once again hosting another awesome event. See you all next year at the Sixth Annual UIAB Pizza Party!